This month we’re taking a break from focusing on the Township. 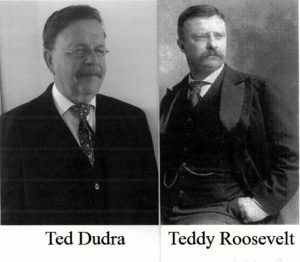 Ted Dudra will present Teddy Roosevelt, the War Hero, the Explorer and the President. Many of you have met Mr. Dudra when he gave a program in 2016 on General A.C. Voris. A retired Plain Local Schools science teacher, Dudra is spending his time with numerous historical organizations. He reenacts for four different wars: the Revolutionary War, War of 1812, Civil War and World War II. 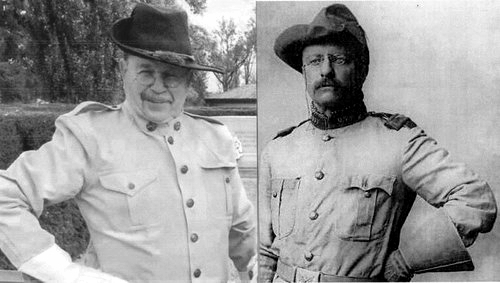 He’s an active with Company G, 29th Ohio Volunteer Infantry Historical Association (Civil War) and Fort Laurens in Bolivar, Ohio (Revolutionary War). Our speaker will be Northamptonite Greg Wagner. He will talk about American Belleek, a fine porcelain made in the late 1800s through the early 1900s. Our speaker will be David Jones of the Northampton-Cuyahoga Valley Rotary Club. He will present a brief history of Rotary and the local Club that meets at Papa Joes, a Northampton favorite. We will hear about some of the projects and causes that the Club supports. November’s meeting is our Annual Business Meeting to review NHS business and discuss and approve business issues. email me back with comments/ideas regarding the NHS that will represent you and be presented at the meeting. The Town That Wasn’t, Was, and Isn’t: Botzum will be presented by Ken A Starcher, VP of the Society. We will look at the area that at various time went by the name of Yellow Creek Basin, Niles, Buckeye and Botzum. This is part of our on-going focus on the Township as we near our Golden Anniversary. June is usually the time of our annual outing. We are still working out details and hope to announce the destination at our May meeting. The story of David Zeisberger, a Moravian Missionary during the late 1700s, as he travelled the Cuyahoga Valley will be presented by Dr. Richard Hasler from the Tuscurawas Co Hist. Soc. Dr. Hasler received the Zeisberger-Heckewelder medal for his research. May: The Town That Never Was and the Town That Was and Isn’t: Niles and Botzum.